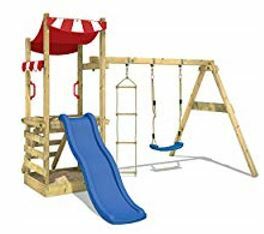 Many thanks again for taking the time to visit - If you are considering buying a Wickey Climbing Frame in the coming days, then make sure to check out this detailed review which will outline all the main features, pros and cons that you need to be aware before you make any buying decision. 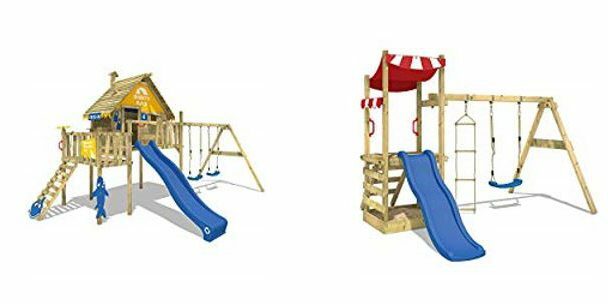 We will also outline several frequently asked questions that will be of interest to you also which have come up in the recent past and also a selection of images of the range of Climbing Frames and Swing sets currently available under this particular brand. Please note also that guide prices can only be outlined at the time of this review as prices can change from week to week or month to month depending on discount activities so please make sure to view the price checkers provided below to ensure you have the most accurate up to date price information. Q. Where are these swing sets made? Q. What age group are they suitable for? A. 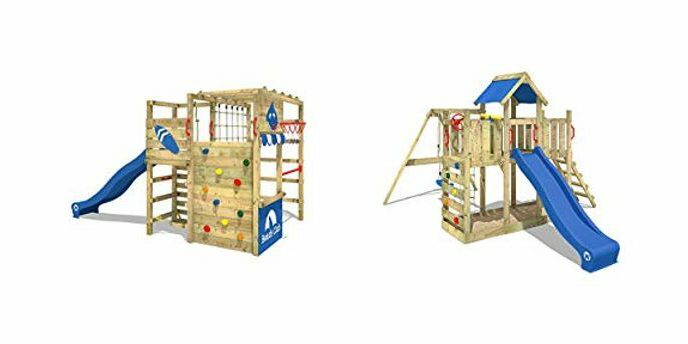 Most of these Climbing frames are suitable for children aged between 3 and 10 years but adult supervision is strictly needed for children under 5. Q. What are the lengths of the slides? Q. How thick are the Swing beams? Q. Do they deliver outside of UK mainland? Q. Is the wood treated? Q. What heights are the upper decks? Instruction manual is always included and the steps are well laid out, easy to follow which makes the assembly process enjoyable and a lot easier to do. Overall quality and design is excellent and back up service is reliable with good assembly instructions - Very sturdy once the anchors are cemented in. If any small parts are missing, they are very good at getting them sent out quickly in a week or so from Germany. As it is made in Germany, there are the additional shipping costs and transport costs to be aware of which will be built into the overall price. Some models need to be ordered well in advance as they may not always be in stock – so plan well in advance if you intend to buy less popular frames. 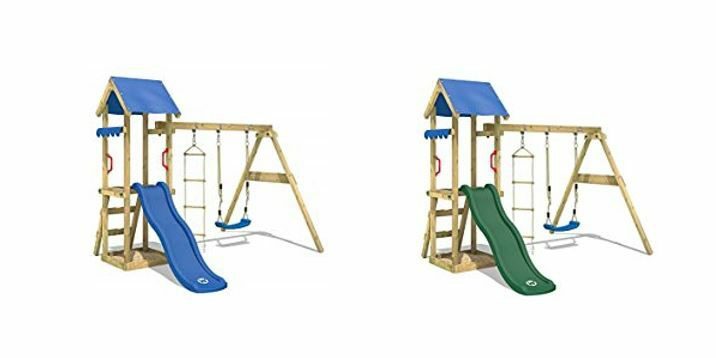 No air gliders or passenger swings where kids can swing in tandem together is available on any of the models we reviewed. Cannot be placed on hard surfaces such as concrete – it needs to be placed on a soft surface with the anchors then cemented in. Some of the larger models can takes 2 or more days to complete and require a lot of attention to detail and hard work. Additional drilling will be needed so you will need to have a power drill in your garden shed. You will need an extra set of hands for assembly, in particular the larger frames. Have you or your kids any personal experience with the Wickey Climbing Frames or Swing Sets in the past? If so, then please share your thoughts and feedback with the wider UK community by leaving a comment in the comment section below – So that they can learn also!!! 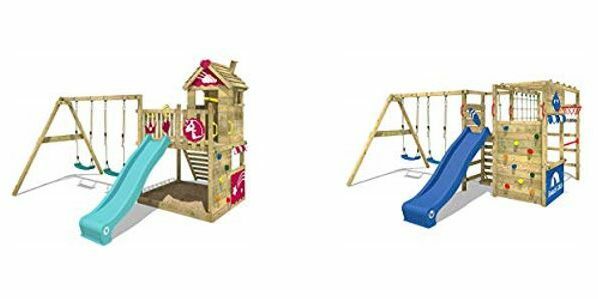 Posted in Swing Set Reviews and tagged cheap climbing frames uk, children climbing frames uk, climbing frame accessories uk, climbing frame children, climbing frame sale, climbing frame uk, climbing frames children, climbing frames children uk, climbing frames kids, Climbing Frames uk, climbing frames uk wooden, garden climbing frames uk, kids climbing frames uk, outdoor climbing frames uk, small climbing frames uk, Wickey Climbing Frames, Wickey Climbing Frames Reviews, Wickey Climbing Frames UK, Wickey Climbing swing sets, Wickey Playsets, Wickey Playsets reviews, Wickey swing set reviews, Wickey Swing Sets, wooden climbing frames uk.